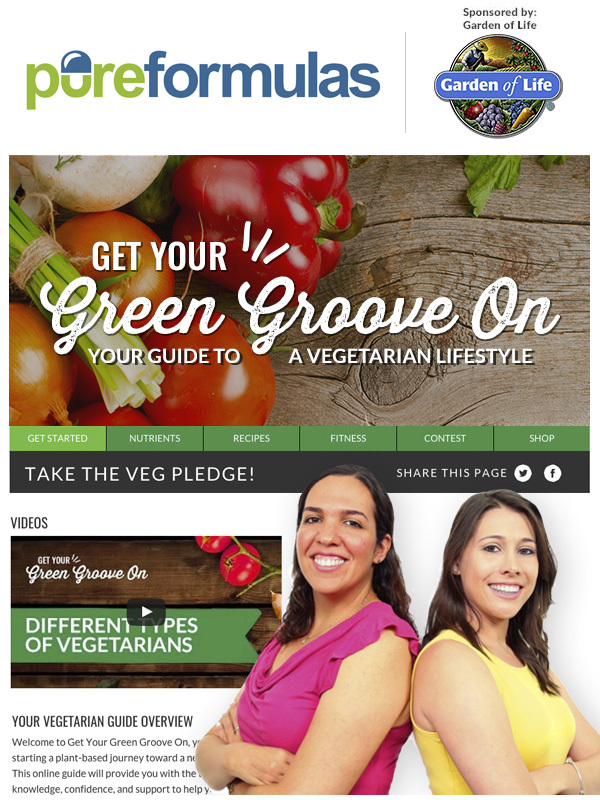 MIAMI, FL--(Marketwired - January 12, 2016) - South Florida-based health supplement e-retailer PureFormulas has launched Get Your Green Groove On, a comprehensive landing environment to guide customers interested in switching to a plant-based, or vegetarian, diet. Sponsored by Garden of Life, a brand committed to empowering extraordinary health, Get Your Green Groove On features six sections with detailed information on all aspects of becoming a vegetarian, starting with the different levels of vegetarianism, advice on realistic goal setting, and a review of the nutrients recommended to help your body adjust to the transition, including suggestions on dozens of Garden of Life products. "We are proud to partner with such a prestigious brand as Garden of Life to present Get Your Green Groove On to our friends and customers," said PureFormulas CEO José Prendes. "Our staff has put a great deal of time and effort into helping educate those looking for a safe and enjoyable way to eliminate animal products from their diet." A recipe section includes nearly 50 vegetarian or vegan meals, including snacks, dips, breakfast and other meals, side dishes and meat alternatives. This includes images and videos on cookware, products and cooking techniques. Throughout the special, more than 20 videos provide additional information, advice and encouragement from PureFormulas' professionals and other experts in the field. Visit https://www.pureformulas.com/get-your-green-groove-on for more information. Get Your Green Groove On was developed at PureFormulas and is the collaborative effort of the company's in-house nutrition professionals, along with the technology, marketing and e-commerce/merchandising departments. Between the months of January and May 2016, PureFormulas will award a basket of Garden of Life products and a $100 PureFormulas gift card. 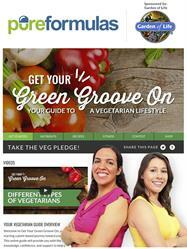 Users should submit a photo of a vegetarian dish and recipe with the hashtag #PFvegpledge. Two winners will be selected each month for the duration of the contest. For more information and contest entry, visit https://www.pureformulas.com/get-your-green-groove-on/contest. Headquartered in Miami, FL, PureFormulas.com is a leader in the online health supplement space, distributing GMP-certified quality products, including dietary supplements, organic food, beauty products, sports nutrition supplements, and pet products, with an average of 600,000 active customers and 100+ service professionals. PureFormulas.com features a secure and friendly online shopping experience providing free shipping on more than 40,000 products. PureFormulas' professionals work with a board of healthcare advisors, naturopaths and chiropractors to keep up-to-date with customers' needs and healthcare trends. PureFormulas' mission is to maintain daily motivation and passion for healthy living, with a focus on high-level customer service and quality products. For more information on PureFormulas, please go to: www.pureformulas.com. As the leader in Certified Organic and Non-GMO nutrition, Garden of Life's mission to empower extraordinary health goes beyond offering some of the most effective nutritional supplements in the world. The company is proud to be certified as a B Corp, reflecting its uncompromising dedication to its customers, employees and charitable affiliations. Garden of Life is also committed to transparency with one of the most traceable supply chains in the world, and is making significant investments in independent third-party testing and verification of its raw materials and innovative formulas. Headquartered in Palm Beach Gardens, Florida, the company's diverse range of more than 250 science-driven supplements includes industry-leading organic protein powders, meal replacements, organic vitamins, and probiotics. Learn more at www.gardenoflife.com.